The iSub Music Streamer lets you stream your personal music collection from your Video Hosting server directly to your iPhone, iPod touch, or iPad, regardless of size and format. Compatible with all of our Subsonic hosting plans, this app puts your entire music and video collection at your fingertips. It is a little finicky with video formats so be warned that the Android apps are much better and Android as a whole is more lenient with its video playback than the Apple iphone. Full support for creating and managing on-the-go playlists. Automatic full song caching for the best network performance with no music drop outs. Manually cache songs (Wifi sync) to listen offline, like on an airplane. Caching of all browsed directories for speedy browsing. Retina display support for beautiful album art while browsing and in the player. Skipping within tracks, even while they are streaming. Resuming music when interrupted by a call or text or when closing the app using the home button while a song is playing. Each music folder is a playlist automatically so when you select a track from an album it will continue to play the rest of the tracks in that album. Shuffle, Repeat 1, and Repeat All when playing an album. Detailed track information by tapping the cover art. Jukebox mode to use your device as a remote control for Subsonic for listening to music around the house. 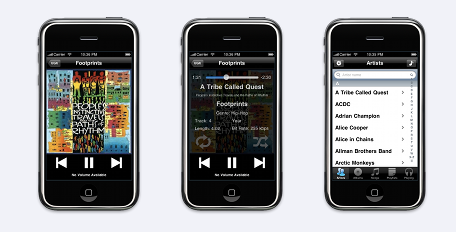 Audiophone is a much prettier Subsonic app for iphone, but it only supports music formats and not video playback. This isn’t another online collection of music you have no control over. By connecting to Subsonic, Audiophone allows you to browse and play your personal collection – in its entirety – over WiFi or cellular networks. Don’t be limited by copyright agreements (I mean, you probably should own your music. ), free space on your mobile device, or the cable tethering you to iTunes.